Dinner is served! 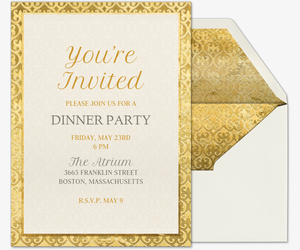 Gather around the table with family and friends for a dinner party, starting with free or Premium digital invitations from Evite. 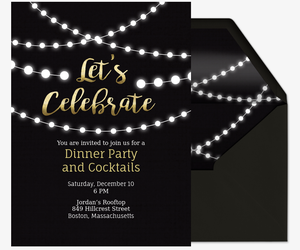 Whether it’s an upscale charity dinner, an outdoor gathering, or a casual meal between a few friends, our dinner party collection has a design to set the tone for your event. Manage your event with ease using Evite’s digital features. 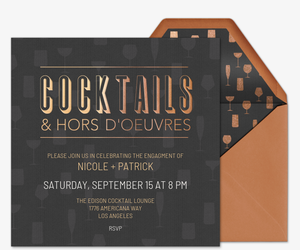 Paperless invitations allow you to track RSVPs, manage your guest list, post comments, and share photos all in one location. Plus, if you’re planning a potluck, organize food and drink contributions using our “What to Bring” list. 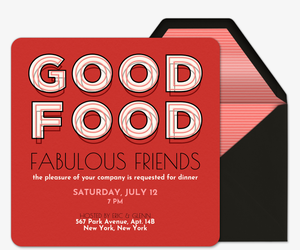 Give your dinner party a special touch by choosing a Premium online invite. 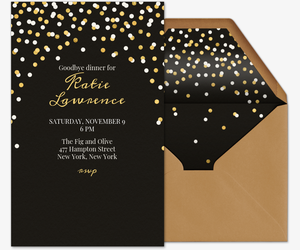 The Evite Premium experience is advertisement-free, and includes envelopes, stamps, additional inserts, and other extra features. Pricing depends on the size of your guest list. 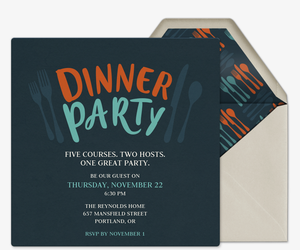 Plan a dinner party like a pro with pointers from Evite Party Ideas. Get easy dinner recipes for delicious eats and planning tips for picky eaters or guests with dietary restraints. Plus, impress guests with our ideas for shaking up an average dinner party or doctoring up store-bought desserts. 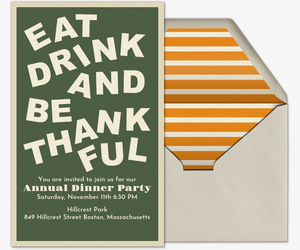 Evite is also the place for cocktail party invitations, hostess party invitations, potluck invitations, family gathering invitations, brunch or lunch, and more. Planning a dinner party around a certain occasion or milestone? Evite also has invitations for birthday parties, baby showers, weddings, bridal showers, holiday parties and more.